So you've probably heard it a million times, that webinars are the most effective way to grow your list and attract potential clients. You might even have a good idea of that you could talk about in a webinar. But your're just too. dang. nervous! Trust me, I've been there before, worrying that you might lose your train of thought, or have tech issues live on air. Or maybe you feel like no one will come or listen to you. I was feeling this way about 3 weeks ago, when my business coach encouraged me to do my first webinar. It had been in the back of my mind for months, but I had never quite pulled the trigger. 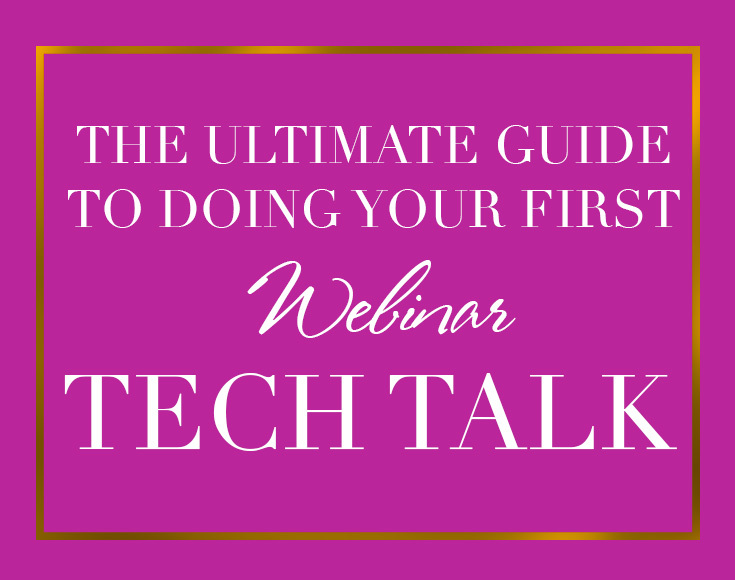 Today, I want to offer an ultimate guide to how I pulled off my first webinar, and the steps I took before, during and after the event. You don't have to get up there and give an anthology of everything you know, perhaps you are giving out 5 tips for __ or 3 mistakes that ___ make. You get my drift? Numbers tend to work very well in titles to bring people in (think Buzzfeed!) You're just going to be giving some tidbits of your expertise. Enough to provide free value, but also whet the appetite of your ideal clients, so that they may consider working with you on a paid basis. For my webinar, I chose "5 Essential Elements of a Luxe Brand that stands out and attracts Dream Clients" I chose 5 things that I look for in a reputable website, and things that I make sure my clients have on the websites that I design. This list could go on forever, but I chose my top 5 to share. 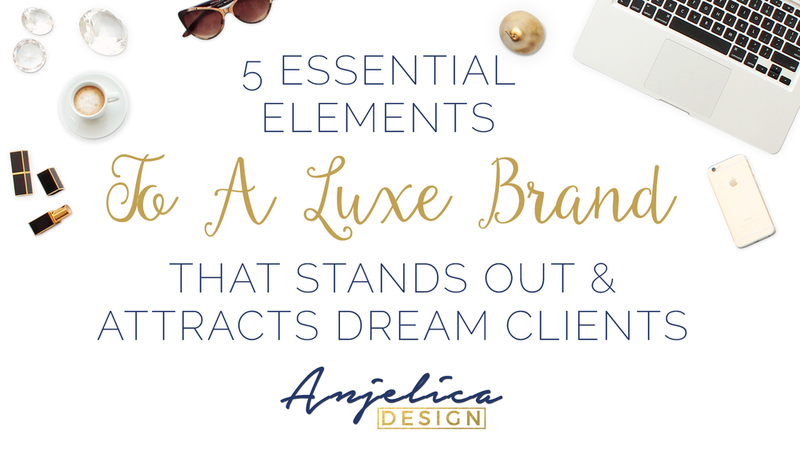 You'll also notice that the title I chose proposes a benefit to the audience, that they can "attract their dream clients"-- If you want to entice people to watch your webinar, it helps to put the intended benefit out there, as opposed to just saying "5 Essential Elements to a Luxe Brand." I am very design minded-- so the importance of visually-attractive promotion is not lost on me. I immediately created branded graphics to promote my webinar, and kept them consistent with my website brand. I used Photoshop to create mine, but Canva also has some amazing professional looking templates that can give you that visual appeal. Pick a template that you like, and repeat it (keeping colors and fonts consistent) for Twitter, Instagram, Pinterest, Facebook-- and whatever platforms you use. Canva has templates that are sized perfectly for each social media site. Consider doing video promotion for your webinar. People are going to be seeing you on video for the actual event, so it helps for your audience to see you in that element beforehand. You can shoot a short 15-second video on your phone/ webcam, post it to social media and even put it on the landing page where people sign up for your webinar. Get a short-link for your webinar sign-up site, like "bit.ly/MyWebinar" and write it out on a large piece of paper. That way you can hold it up during the video, and it's easy for people to remember. You can create short links with bit.ly, and if you create a free account, you can customize them to whatever title you want. For Example, mine was bit.ly/LuxeWebTraining. You will need to create a minimum of 2 pages to host your webinar on your website, unless you use a paid tool like Lead Pages. I went the free route for my first webinar. The first page I created was a webinar sign-up page. This is the link you will send people to to enter their email address, so they can get on your list, and secure their spot in the webinar. You will want to start with a page that has minimal distractions on it. Many themes have a "Landing Page" template that you can use. It has no menu at the top, so that people will not be tempted to go away from the webinar page. You want to start with an enticing headline, addressing the need or desired outcome that you potential audience has. Include a short introduction to yourself, and why you are equipped to teach on this subject. List out the things that your audience will learn during your webinar, and maybe add some icing on the cake. This could be a free downloadable worksheet or checklist that corresponds with the webinar topic. For example: maybe you're teaching people how to start a website. You may offer a checklist that includes all the things they will need, or a worksheet with spaces to fill out the text that they will put on the website. These types of extras are very attractive, even if they didn't take much work from you. You can also design something like this in Canva! Then you want to click the button that says "Create a Hangout On Air." In the pop-up page, you will name the Webinar, and provide an accurate description. All of this will be saved as an un-listed Youtube video on your profile after you finish recording the whole Webinar. Select "Later" for when you want the webinar to start, and don't make it "Public." Just invite your own email address, so you'll get a confirmation link. Then click "Share." You will be taken to a page where your webinar lives. I strongly suggest saving this link, because you can go straight there and start broadcasting when you are ready to start the webinar. When that time comes, you'll click the "Start" button-- which you can see in the screenshot below. To get the video embed code to place on your website, Click the "Links" icon that I have pointed out in the screenshot. Copy the entire "Video Embed" code, and that is what you'll put into the live webinar page on your website. The screen will be blurred on your website, until you begin the broadcast at webinar time. I also embedded a chat box on my webinar page, that you can view here. You can see that my webinar was recorded and saved as a Youtube video. This happens automatically. The chat box was created for free through Chatwing. It's a pretty cool service, and allows your viewers to comment and chat using their Facebook or Twitter profile images. It's pretty simple to create a Chat, grab the embed code, and place that on your site, beneath the Google Hangout. Are you looking for a designer and brand strategist to help you ditch the website shame and craft opt-ins and webinars to attract your ideal clients? Well then I think it's time for us to get on the phone! Apply for one of my Complimentary Brand Breakthrough sessions, and find out how I can help you up-level your business! apply for a brand breakthrough session! If you don't already have one, you'll need to set up an email list. I prefer Mailchimp, because its free for your first 2,000 subscribers-- also, it integrates well with lots of other software that I use. All you need to do is create a subscriber list after you register. I use a plugin called "Mailchimp for WP" to put the opt-in form anywhere I want to on my site. It links with your current Mailchimp account, and lets you choose what subscriber list you want the form to direct to. You'll see on my sign-up page, that people can enter their information right beside the promo video that I recorded. The plugin comes with a shortcode (looks something like this: [mc4wp]) and anywhere I enter that, the form will show up. Make sure that you test the opt-in form with your own name and email address, and check that email to make sure you get a confirmation message from Mailchimp, and that you are added to the list. Once you've determined what you'll present on, start creating a Powerpoint or Keynote presentation to illustrate your points. You will be showing this presentation on screen for most of the webinar (as opposed to your face.) Just like you'd present a project in school or work, you will describe each of your points in bullets-- and elaborate on them during the webinar. I suggest doing a test run out-loud, so you won't be as nervous on the big day. I was not so well-acquainted with Hangouts before I did my webinar, and it just added to my nervousness. Watch a video on how to do Hangouts On Air, and consider doing a test run before the big day. Once you hit that "Start" button, you will see your face on screen, but you will not be 'on air' until you hit the "Start Broadcasting" button below the image of yourself. Also, know how to share your screen, and how to go back to your webcam view. You'll want to start the webinar by sharing your screen, and having the Power Point up in full view, then come to your face when you introduce yourself. You may also want to have a friend standing by who can text you and tell you that your video is showing up. I was so paranoid that I was not actually recording for the beginning of my webinar, and all I wanted to do was text my sister and say "CAN YOU SEE ME??" Of course I was showing up just fine, but I think I expected to hear a noise, or I expected to "feel" like I was broadcasting LIVE to the world, as opposed to just sitting in my room talking to a laptop! Don't be afraid to promote yourself in the days before the webinar. Use those graphics you made, and post them several times on your social media platforms. Get on Periscope and tease your webinar to your followers (and have that short-link on a piece of paper!) Tell your regular Facebook friends, as well-- because they may have friends who are interested in your topic. Consider putting up some Facebook ads or "Boosting" your promotional posts about the webinar. I got most of my attendees through Facebook ads and I only had a budget of $5 per day! Think about how much it is worth to you, if you get just ONE new client from the webinar. It may be worth it to invest in ads, especially if you have a small audience. If you're like me, you get pretty nervous speaking publicly. All you have to remember is that people are on this webinar because they believe that you have some creditability. You are definitely doubting yourself more than those people are doubting you. If you get your tech issues ironed out and practiced beforehand, that will definitely help you calm yourself. Make sure you have the air conditioning on, keep a glass of water nearby (it'll get hot!) Breathe deeply and just remember to speak a little slower. We tend to speed up when we get nervous. Remember that you are providing value, and it'll all be over in no time! Even if a million people don't come to the Webinar, you can re-purpose that event into a recorded event opt-in that you can collect emails for. That's just what I did with my webinar. I used the same powerpoint and recorded the webinar again in a quick, 15-minute mini-course, that I used as an opt-in. I was less nervous on this one because it is recorded and edited-- not live. If you don't know how to edit video, you can simply use your webinar that Youtube/ Google Hangouts recorded, and make it your opt-in. Be sure to send that re-play out to your subscribers, in case they missed the live broadcast, and include a call to action at the end. Whatever it is that you want them to buy or sign up for, this should be clearly stated at the end of the webinar, and in your email correspondence after. After reading this guide, I hope you are ready to put yourself out there and do your first webinar! Just remember that nobody is perfect, and if you aren't going to start now, when will you?? In the comments below, let me know if you have any questions, or just tell me your feelings on your first webinar (whether you've done one or not) it's time to put yourself out there!